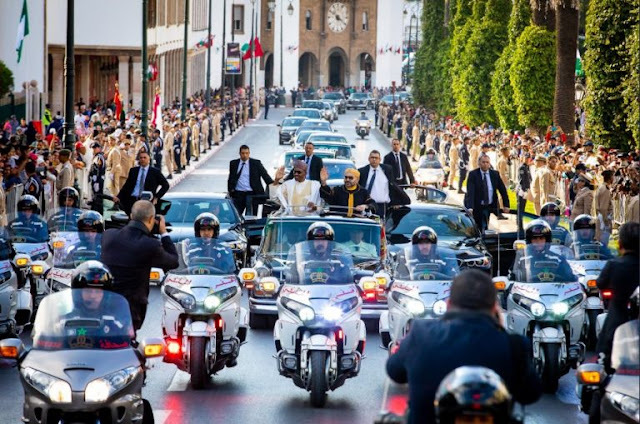 President Muhammadu Buhari has returned to Abuja after two-day official visit to Morocco where he was received and accorded `five-star’ Royal reception by the Moroccan leader, King Mohammed VI. aircraft conveying the President and some members of his entourage back home from Rabat, Morocco, landed at the presidential wing of the Nnamdi Azikiwe International Airport, Abuja, at about 5.15p.m. The News Agency of Nigeria (NAN) reports that Governors of Ebonyi and Jigawa, Dave Umahi and Badaru Abubakar respectively who were part of the president’s entourage to Morocco; the Inspector-General of Police, Ibrahim Idris and other top government functionaries lined up to receive President Buhari at the airport. While in Morocco, Mr Buhari and King Mohammed VI of Morocco held bilateral talks where Nigeria and the Kingdom of Morocco signed three agreements, which included a regional gas pipeline that will see Nigeria providing gas to countries in West Africa sub-region that extend to Morocco and Europe. The 5,660 km long Nigeria-Morocco Gas Pipeline (NMGP) will reduce gas flaring in Nigeria, encourage diversification of energy resources and cut down poverty through the creation of more job opportunities.